The most important thing to remember about stain, is that if you want to apply a clear finish over the stain, they have to be compatible with each other. To check for compatitility, stain a scrap of wood, let dry, apply a coat of the finish, and let dry again. If the finish makes the stain look blotchy, that stain and finish obviously don't work together. If it looks good, then go for it - but consider doing one more test: if you plan to paint or glue on details after the piece is finished, you may also want to check how the paint or glue behaves when you apply it to the stained and/or finished surface, before you do it on the actual piece. My favorite stain is made by Liberon, I think it's spirit-based (I think they call it wood dye nowadays). I can't say I've really compared different type stains - this one works fine for me while water-based stain was a constant source of irritation, so I'm content and haven't felt a need to explore other types. Water-based stain tends to raise the grain and can also cause the pieces to buckle, especially if applied liberally. They're my least favorite. I've read that there are solvent-based and oil-based stains too, but I don't know anything about these. Marker type stain pens are popular among miniaturists as they're very convenient to use. Minwax is one brand. I have some ChartPak stain pens, and I've noticed that they're not quite compatible with Danish oil. The longer you leave the oil on, the more it dissolves the stain (maybe it's oil-based?)! But it works if you wipe off the oil right after you've applied it, and can accept that the stain may turn a slightly lighter shade. I'm generally not a fan of water-based (polyurethane) clear finishes - I think they're way too glossy for small scales. 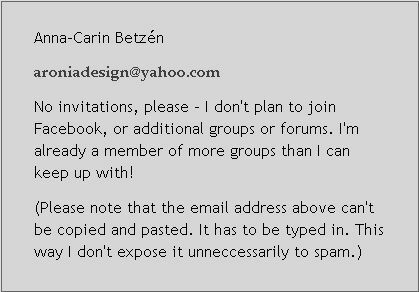 But I've used it for a high-gloss finish on painted furniture, and also to basecoat unpainted wood that I'm going to "age" with antiquing medium, as described near the bottom of this page. Danish oil is a good finish because it's up to you how shiny it'll be, depending on the number of coats. Each coat should dry for 6 hours, and the finished piece has to dry for a couple of days, so it does take time. There are other types of oil too, like Tung oil and Walnut oil, though I haven't tried them myself. Walnut oil is said to dry much quicker than Danish oil. I usually apply two coats on 1:48 scale furniture, but a higher gloss would require three or more. In 1:144 scale, I use one coat for a satin finish, or two coats for a more shiny one. Apply a coat of Danish oil with a paintbrush. Wait a few minutes, then wipe off the excess. Go over the piece with the toothbrush, taking care to remove the oil from crevices like moulding grooves or around doors and drawers. If you want to apply additional coats, let it dry for at least 6 hours before you start over. You can polish lightly with the toothbrush again (or a piece of brown paper, depending on the shape and size of the piece) before applying the new coat. This it also removes tiny wood fibres sticking out from the surface, and will leave it silky smooth when it's completely dry. Leave it to dry for at least two days after the last coat. Check that it feels completely dry to the touch; if in doubt, leave it for another day and check again. I've tried different types of hobby paint and settled for FolkArt paint (water-based) for wood and Model Master's paint (solvent-based) for plastic and metal. 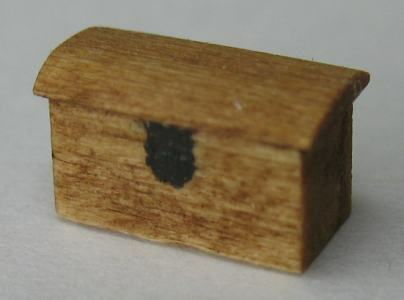 If you have problems with paint raising the grain of the wood, you can seal it with a clear finish first (as described below), when dry sand it lightly with a piece of a brown paper bag, and then paint it. This gives a nice smooth paint finish. A chest of drawers will look more like the real thing if you paint it before you glue on the drawer fronts. So, assemble everything apart from adding the drawers, then paint the body and the drawer fronts individually, and finally glue on the drawers. The same goes for doors on wardrobes. When applying paint or a finish, I often stick the back or base of the piece to a tongue depressor or bit of stripwood using little bits of foam tape (or try regular double-sided tape or Tacky Wax or BluTack). Then I can handle it easily, and put it down to dry without smudging the finish. For tiny flat bits like 1:48 scale drawer fronts or 1:144 scale doors you don't need that much holding power - just stick them on the tacky area of a Post-it note! Apply a coat of any clear finish. Go over the piece with a toothbrush - not straight away, but before the finish is quite dry. This ensures a smooth satin surface without shiny spots and buildups. Let it dry before you paint or age it. Paint the piece of furniture and let it dry, then apply FolkArt's Antiquing Medium (I used color #819) and wipe it off at once. This gives a gentle all-over worn look. The photo shows a 1:48 scale chest I made. 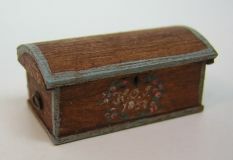 I painted it brown and blue and did the tole painting, and then antiqued it. The chest is my miniature version of my great great great grandfather's 1854 chest, which now belongs to my 2nd cousin's family. Having a miniature replica of it means way more to me than just having the photo! Apply a sealing clear finish as described above. Then apply FolkArt's Antiquing Medium and wipe it off at once. The sealing clear finish is essential as it prevents the wood from absorbing too much antiquing (the color would be very dark otherwise, especially at the end grain). The wood will have a slight sheen. The tiny chest in the photo is from my 1:144 scale Adobe roombox "El Cisco". You can also mix antiquing medium (or brownish black paint) with a lot of water for a "dirty wash", and apply it on unsealed wood. This gives the wood a different finish; "dry" and a little weathered. Always try on a sample first, to make sure the color isn't too dark (if it's too light, you can just go over it again, perhaps with a wash containing a little more antiquing/paint). This method takes advantage of the fact that it's easy to remove wet paint from sealed wood. It's essential to stick the piece to a bit of wood for ease of handling, otherwise the process will be messy and unpredictable. Stick it to a tongue depressor for ease of handling. Apply a sealing clear finish as described above. Let it dry. Paint with your chosen water-based paint. You may want to thin the paint a little to extend the working time. Using a Q-tip (cotton bud), remove some paint from edges and other places you want to look worn. If you've removed too much paint, touch it up again. Continue until you're happy with the results. Don't touch it or remove it from the tongue depressor until quite dry. 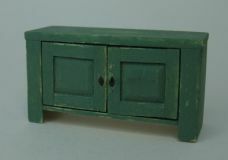 The photo shows a Gustavian kitchen dresser or cabinet in 1:48 scale.